During today's Nintendo Direct festivities it was confirmed that a new Pikmin game is coming to the 3DS in 2017, and it adopts a 2D side-scrolling approach. In Europe there's an extra treat available on the Wii U, to celebrate the news. New Play Control! Pikmin is available now on the Wii U eShop in Europe; it's the Wii version that was released (originally) to promote Remote and Nunchuk controls. Weirdly it's just called 'Pikmin' on the eShop, perhaps because Nintendo didn't want to confuse newcomers. Another bonus is that it's part of a promotion with The Legend of Zelda: Skyward Sword, also released today. If you buy one of the two you can get 50% off the other; both cost £17.99 / €19.99, so you can get both on the same console / Nintendo Account for £26 / €30, if our maths is correct. The deal's running until 15th September. Are any of you in Europe tempted to pick this up? If new play control pikmin comes to north america I will take my Wii u off the retirement shelf!!! Availing the promo. I hope they bring Pikmin 2 as well. Can we play SS with the gamepad only? I was able to snag the second Pikmin on the Wii, need to give this one a go. If it was Pikmin 2, I would. 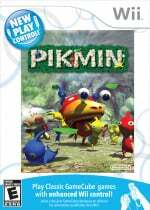 Too bad, that the Wii version doesn't support the classic and original control scheme of Pikmin. Otherwise we could play the game with the GamePad. Of course the controls with the WiiRemote are great but sometimes it is good to play a game in the bed, only with control sticks and buttons. Do we know if there are any plans to bring to NA? It would be nice if this came to the US! Does this have new play control in the sense that it has the same gamepad controls as pikmin 3? Or just the wiimote thing? I want both Pikmin 1&2 (Wii versions) in America. Preferably with a discount when buying both. I'd buy it if it included the stylus control. Since it won't, I can just use my Wii discs. Pikmin was awesome. Never got round to playing SS. Not forking out £26 for them. Is this the first 'GameCube' game on the Wii U eShop? @Oubie Wind Waker HD? EDIT: And Twilight Princess HD. EDIT2: And Metroid Prime Trilogy. @Pahvi Oops I didn't think of the Zelda titles because they're full remakes with HD graphics etc. Metroid Prime 1 and 2 are great examples yes, forgot about them (shame on me to forget them haha). What happened to the NA discounts on Wii releases? I might actually buy a few if they would offer some kind of launch discount, like with the Metroid set or Mario Galaxy 2. I have the discs for all of these, and at $20 I'm not tempted to buy again. At $10-15 I may rethink my stance. I was hoping for an HD remake, and i was a little dissapointed when i saw it was just the regular version. WHYYYY???? I need that NA Version!! This reminds me of gotta play some more Metroid Prime Trilogy later today. @Desy64 How could you play Skyward with traditional buttons? You need to swing the sword down, diagonal, left, right, slow, fast, even up to charge. That is impossible to copy to simple buttons. I have both GameCube and Wii version of Pikmin and the Wii version is the best because of the controls. I really enjoyed playing Pikmin on the Wii. I couldn't complete it on the GameCube but I could on the Wii. €30 for 2 games ain't bad but they can probably be got cheaper. I don't like digital. Hopefully they also bring Pikmin 2 to the e-shop someday, then I might download them both. Maybe buying the discounted Pikmin 3 someday too. Then I am all set. Yay!! I really hope NA gets it too . v .